Revolting Subjects was the name of a Leverhulme Research Fellowship Project I was awarded in 2010. The Fellowship culminated in the publication of a book ” Revolting Subjects: Social Abjection and Resistance in Neoliberal Britain” (Zed 2013) and a series of related articles and edited collections on marginal social groups, stigma and resistance. Revolting Subjects is published by Zed books (a not for profit publisher) and offers a groundbreaking account of social abjection in contemporary Britain, exploring how particular groups of people are figured as revolting and how they in turn revolt against their abject subjectification. The book utilizes a number of high-profile and in-depth case studies – including ‘chavs’, asylum seekers, Gypsies and Travellers, and the 2011 London riots – to examine the ways in which individuals negotiate restrictive neoliberal ideologies of selfhood. In doing so, Tyler argues for a deeper psychosocial understanding of the role of representational forms in producing marginality, social exclusion and injustice, whilst also detailing how stigmatization and scapegoating are resisted through a variety of aesthetic and political strategies. ‘In this brilliant book Imogen Tyler explores the new political and psychosocial landscapes of the UK. She charts the emergence of new, precarious, political collectives and the co-option of protest against neoliberal hegemonies. Tyler offers a stunning re-analysis of social abjection. This is just one of this book’s crowning achievements. The arguments and analyses will inspire and fascinate all those seeking to understand contemporary social insecurities.’ – Margaret Wetherell, emeritus professor, The Open University, and professor of social psychology, The University of Auckland. ‘A brilliant must-read book. Tyler brings an ambitious and unique urgency of voice to the ‘revolting subject’ of heightened inequalities in neoliberal times. Perspectives of valueless-ness are forcibly shifted with persistent attentiveness and interdisciplinary observance of affect, abjection and disgust; of protest, publics and politics; of youth, parenting and popular (mis)representation. Hard edges of intersecting social divisions sit with a caring call for ‘common grounds’, to be revolt-ing. 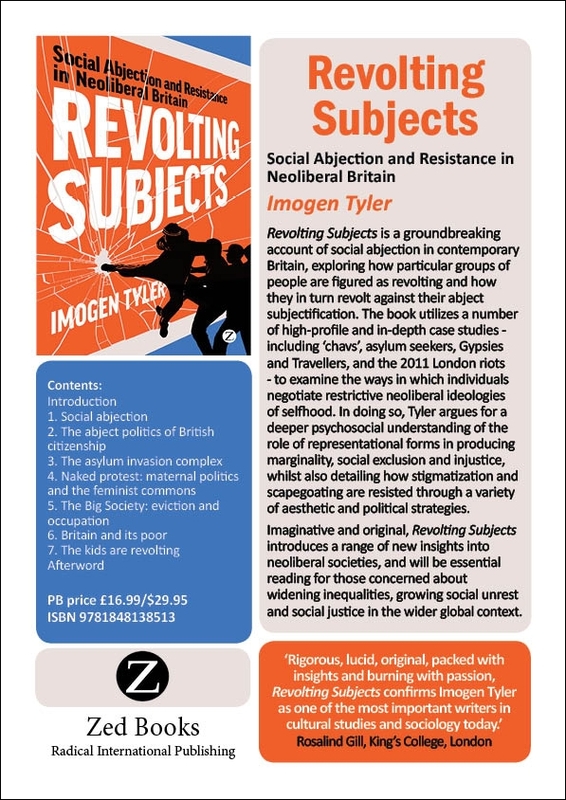 Revolting Subjects truely conveys the essence of active, public sociology…’ – Professor Yvette Taylor, Head of the Weeks Centre for Social and Policy Research, London South Bank University.